With the film version of Ready Player One due out this weekend from Steven Spielberg, it’s past time that I take a look back at Ready Player One, the book by Ernest Cline. I really wanted to love Ready Player One, and it seemed right up my alley, despite some reservations from certain reviews and excerpts I’d seen online. I wanted to read the book before the film came out, even if I was years late to the party. But I came away not only disappointed but also extremely frustrated. I understand its appeal, and I don’t begrudge anyone for liking it, but I found reading it to be an unpleasant experience, in spite of its creative setting and generally entertaining story. Overall I’d give the book a C-, but read on for 5 Things about Ready Player One, 3 that I hated and 2 that I liked. In an effort to cut through the backlog of movies left to review after everything that’s happened the last couple of years, I’m going back to movies I skipped and giving them each 5 Things. These can be things I loved, things I hated, or anything in between, they’re just 5 thoughts I had about the movie. 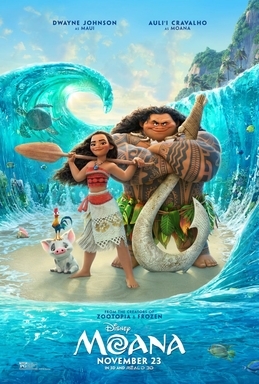 Today I’m tackling Moana, one of my favorite movies of 2016, and probably my favorite Disney animated film since Tangled. I gave it an A+ in my movie log at the time I saw it, and I probably love it even more today than I did then. It’s gorgeous, has fantastic music, and characters I find immensely relatable and compelling. So without further ado, here are 5 Things I Love about Moana! Thor: Ragnarok is a blast. It’s Thor’s best solo outing thus far, and one of the most fun Marvel movies yet. 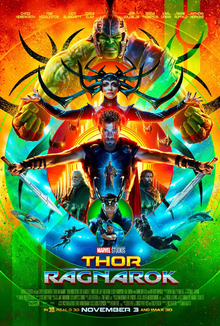 It may not be the most emotional movie in the MCU, nor does it pack the biggest punch despite the two heavy hitters Thor and Hulk leading the way, but it’s stylish, hilarious, and unique. Ragnarok may have been one of the Marvel “Phase 3” films I was looking forward to the least, but it has rapidly become one of my favorites and I can’t wait to see it again. Overall, I’d give it a solid A-, but instead of writing a normal review I’m instead going to give you 5 Things from Thor: Ragnarok that made a difference to me, good or bad. I might work this format into future reviews, or try to use it to take care of some of my review backlog. In this case, I’ve got 4 Things I liked about Thor: Ragnarok and 1 Thing I didn’t like. Read on, and let me know if you agree with any of my picks, or what you liked or disliked about the God of Thunder’s latest adventure.